It's finally here - the day we've been looking forward to for a year. 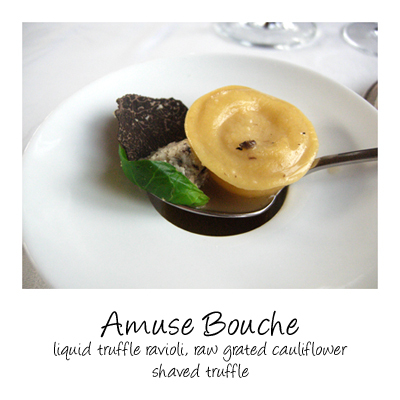 Yes, we are truly truffle tragics. 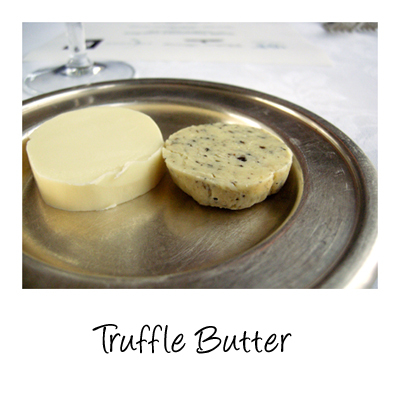 Just like last year, the smell of truffle butter fills the dining room. 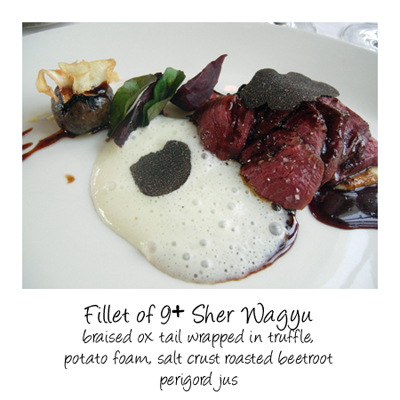 The truffles used today are from Tasmania and the wines are all from Chandon - what impresses us throughout the meal is just how well the wines have matched the respective dishes. We were warned that the filling could be hot - it's to be eaten in one bite, the liquid center exploding in your mouth. A great package of different textures and tastes - chewy, crunchy, earthy. 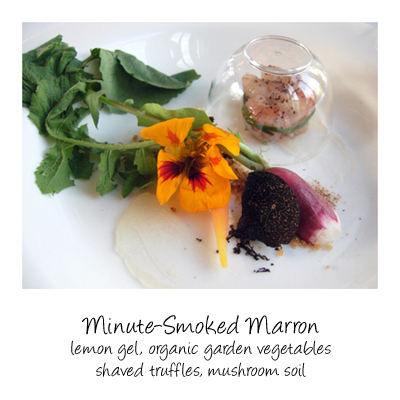 The marrons are smoked for one minute and presented wrapped in chive and covered with a clear dome. Along side you'll find malt soil, mushroom & potato soil, lemon gel, Nasturtium leaf and flower and a halved breakfast radish - an ode to the organic garden. This dish is full of clean clear flavours, it's vibrant. The marron, beautifully fresh and the only cooking is basically done with smoke leaving them plump and tender. Once again it's sad to see how many people don't eat the greens or the flower. 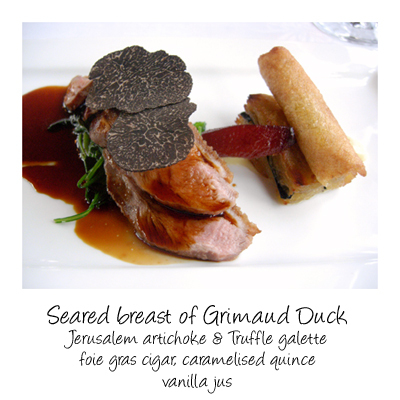 Grimaud is a cross breed of Barbary and Muscovy - it has the flavour of Barbary and juiciness of Muscovy. Indeed it was quite meaty but still tender and juicy in the mouth. The foie gras cigar is wrapped in brik pastry adding another element of decadence to the dish. 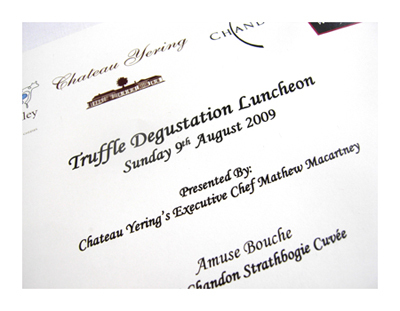 Interesting to note that the wine carried notes of vanilla and quince. 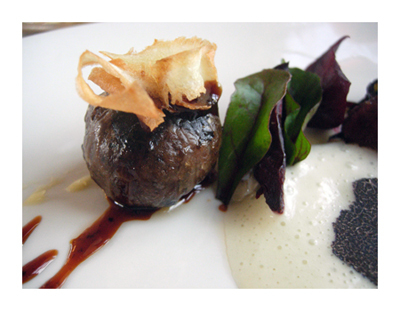 The oxtail was certainly an equal on the plate - covered with shaved truffle and then wrapped in crépinette - this dense orb was packed with flavour. Sitting under the quenelle of goat's curd is oak caramel - the oak used to infuse this caramel is from the property. There's a really interesting texture to the caramel and I'm particularly interested to know how it was made - the caramel is used to offset the slight acidic nature of the curd. The strip to one side is a mix of grapes and candied walnuts intermingled with olive jam. This olive jam has been made by their olive oil supplier. 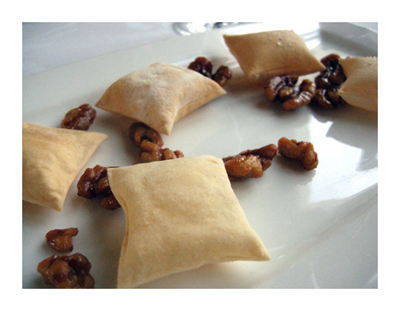 Because you can't have too much of a good thing - extra cracker pillows and candied walnuts. The truffled honey ice-cream served with shaved truffles was simply delicious - the combination of sweet and earthy works well. 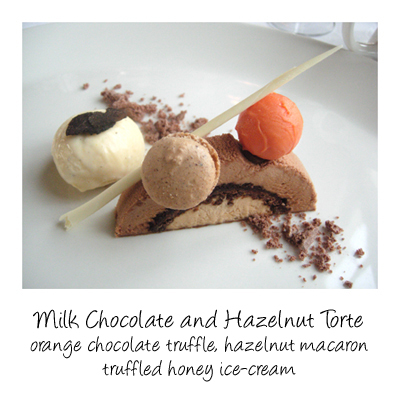 The hazelnut macaron had that typical crisp and chewy shell while the orange truffle was bursting with pure orange flavour. 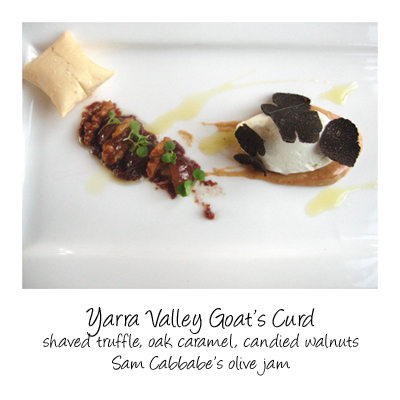 Next year the lunch will be moved to July which is early on in the truffle season and the truffles will be sourced from the Otways and Yarra Valley, we're really interested to see how the local truffles are developing. I should also add belated congratualations to Mathew and the Chateau Yering crew who were recently awarded best Modern Australian - Regional from the Restaurant and Caterers Association. How much did they pay you to delete the Cutler and Co review? sorry guys, seem bloglines messed with my continuity. And eke, I accidentally believed peeps sell out first.